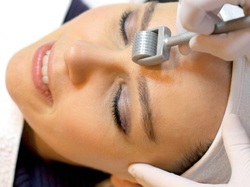 Dermaroller offers amazing results without the inconvenient ‘down time’ that comes with more aggressive laser treatments and deep chemical peels. The procedure - as seen on Channel 4’s Ten Years Younger and Embarrassing Bodies - uses tiny micro-medical skin-needles to stimulate the skin, encouraging regeneration and repair, leaving you with smoother, brighter, healthier, younger-looking skin. Dermaroller is a natural process that has an excellent safety profile when used by trained medical aesthetic practitioners. It stimulates the skin to regenerate and repair itself without adding foreign substances to the body or taking anything away. The Genuine Dermaroller™ device incorporates advanced German medical engineering; manufactured using Dermaroller GmbH, Germany’s Medizinisch Nadel Technik™ to provide a superior and safe treatment that delivers the highest levels of clinical quality and efficacy. Dermaroller is fantastic for the repair of acne scars, for the regeneration of the face, neck, décolleté and the back of the hands and for the treatment of stretch marks on thighs and tummies. Due to its notable safety profile, Genuine Dermaroller™ Therapy™ is suitable for use on darker skins and for use during the summer months - when other treatments are more risky due to increased UV sensitivity. The Genuine Dermaroller™ triumphed at the Aesthetic Awards 2011-2012 where it won by popular vote the Gold Award for Facial Treatment of the Year and the Consumer Choice Treatment of the Year, a testament to the outstanding results being achieved from the treatment when provided by trained medical aesthetic practitioners and their clinics. With recovery often taking place the same day as the procedure is carried out, the patient will just look like they have moderate sunburn following their Genuine Dermaroller™ Therapy™ session. For advanced repair of the skin and to enhance the procedure patients are advised to use the exclusive Endocare Natural Skin Regeneration range, which uses a natural-growth-factor mechanism for clinically-proven skin regeneration and aids the repair of damaged and recovering skin undergoing cosmetic treatment. After undergoing Genuine Dermaroller™ Therapy™ patients are advised to stay out of the sun for prolonged periods of time to further protect their skin. Of course, an every day, year-round approach to sun protection is essential. The new Heliocare UV and photoimmunoprotection range provides skin-ageing prevention and protects and improves skin-health. It is the only sun protection range to contain Fernblock™ Photoimmunoprotection Technology, which is derived from a natural fern and is clinically proven to protect skin from the harmful effects of UVA and UVB radiation.